On the scorched Earth below, the marine makes his way through armies of aliens, slowly making his way to their stronghold. Along his way were mountains of stinking, maggot infested corpses of humans, aliens and animals. The closer he got, the more of the grotesque growths he encountered. He also came across many small green portals, humming and hovering above the ground, occasionally spitting out angry aliens. When his timing was right, he could throw them right back through with the force of the shotgun. His armour’s computer chirped, he received a message from Commander Thompson. “Marine, this is Commander Thomson, when we were in orbit we discovered a UAC colony on the Earth’s moon. They discovered us and neutralized the Echelon. We are now being boarded by UAC personnel. Be advised, Thompson out.” The image melted away, the marine was rather surprised by this bit of news. So the UAC is still operating, how quaint, they’ve conveniently survived their own undoing, while exterminating ninety-nine percent of their own species. I really hope they’re finished with portal technology, who knows what another accident could do. He still had a long way to go and the area was badly infested. He cautiously continued along. Dr. Kronos stepped through the doors to the lab. “Greetings, Doctor. What is our current status?” he asks. Campbell swirled his chair around to look toward Kronos. 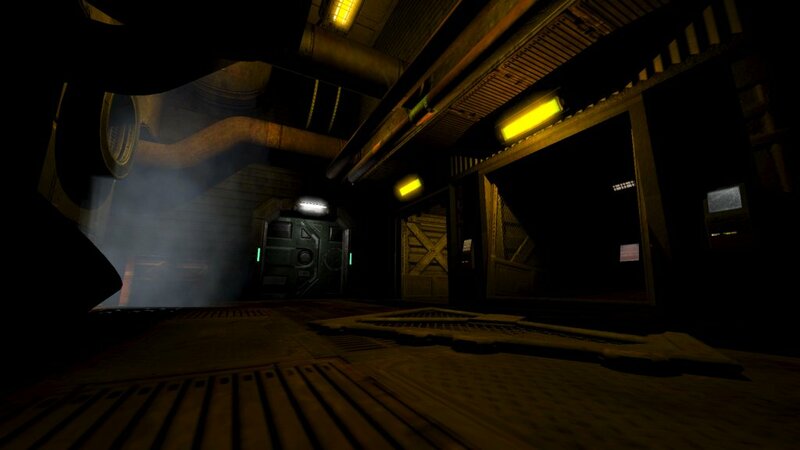 “Acidic levels are adequate, simulation is stable, and Dr. Mason is adjusting the containment field emitters, but all other hardware is functioning normally” Kronos walked over to his terminal and touched a symbol. 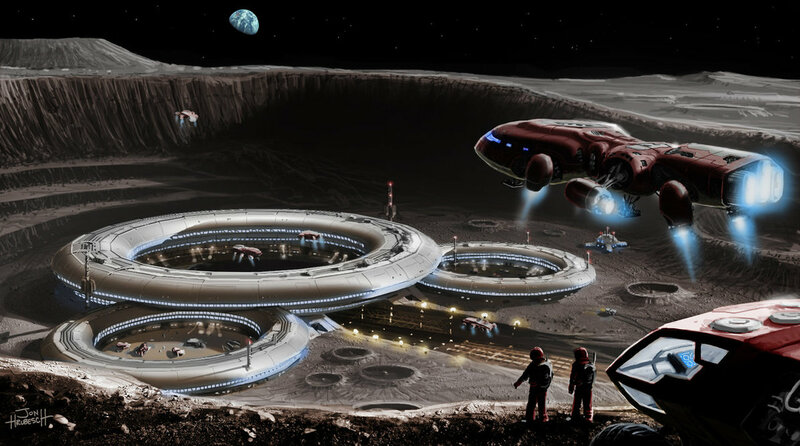 Outside the lab, on the face of the moon, UAC marines stood in formation as the survivors from the Echelon were escorted at gunpoint from the Echelon into a large monorail car. The marines were gripping plasma rifles. Commander Thompson led a single-file line of the survivors. “Keep moving Thompson, we don’t want any accidents” one of the marines taunted, others tracked her with stares of undisguised perversion. The Commander hardly needed to be reminded how hopeless the situation was, she kept her eyes ahead and marched along. From the windows of the colony HQ, Chief Administrator Nexson and Master Corporal Revok watched the long line of survivors move toward the monorail station. “Well Corporal, it seems we have some new volunteers for the portal mission” said Nexson. The Corporal regarded the Administrator with a satisfied smile. Dr. Mason strode into the lab, “The field emitters should be three-point-two percent more efficient” he said. “Commendable work, Doctor Mason. Both myself and the Administrator are deeply impressed with your work. Mason was surprised by the sudden compliment. “It certainly is” said Kronos, studying his terminal. “We are going to experiment on a subject that has been injected with the BSK genetic serum and is now being extracted from the simulation” he said. Kronos’ monitor glowed with images from within the simulation. Kronos responded loudly “The serum may be in extremely short supply, but its shelf-life is not indefinite, it must be tested now if it is to be tested at all” Kronos continued to watch the feed from the simulation in eerie silence as Mason and Campbell exchanged concerned looks. 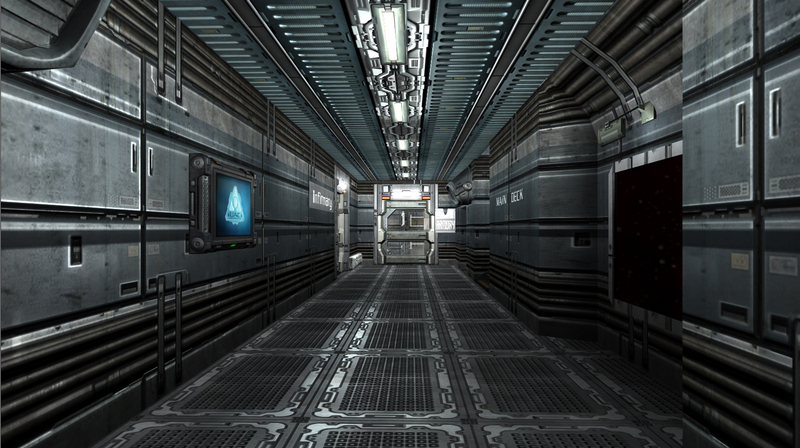 The marine in the simulation turned down a hallway and came to the door of the hangar-bay. He cleared the security check and the massive door raised upward. The capsule ascended from the test chamber’s floor and split apart, revealing the test marines’ white reflective armour. Cables attached to the armour retracted into the floor with the capsule, the opening in the floor quickly closed again. Campbell was monitoring the simulation and the marines’ vitals. “Simulation will fade and terminate in twenty seconds” he said. Dr. Campbell frowned at the energy levels of his monitor, “Energy levels are fluctuating, this extraction may be rather… bumpy” he said with apprehension. Kornos watched him sharply for any sign of human error, Campbell was clearly handling the equipment properly. “I’m sure he noticed that, but its hardly any reason to abort” Campbell commented. Kronos stood behind his terminal, the monitor’s light flooding the Doctors small glasses. “Yes, I would agree” he said. Another moment passed silently, the test-marine stood motionless. Then Campbell said with relief “Simulation terminated” The marine left the simulation with a jolt and found himself disorientated. He shot his head around, scanning the replica. Kronos watched as the marine began to step through the experimentation chamber. “This is likely to be an intense procedure, so stand-by on emergency counter-measure systems” Campbell and Mason acknowledged. Kronos stood above his terminal and said “I will handle the gateway sequences for this experiment” He ran a quick test and then commanded the system to open a level one gateway. The marine marched toward the security locker as demonic whispering echoed through the area. Portals were beginning to form. Somehow from the start of the extraction he had the impression of the test and its danger. In a flourish he opened the locker and grabbed the plasma rifle and magazines, quickly spun around and fired. Hissing, clawing Imps were burnt through. More monsters appeared from the green energy only to be burnt to ash on arrival. From the observation room, they watched the marine move through the area, aggressively attacking the aliens that appeared throughout the area. “I am reducing the area and moving to level two in five seconds” comments Kronos. The other researchers were silently glued to their stations. The marine was standing in the centre of the area when the large-jawed demons appeared, large sections of wall slammed to the floor, making the arena smaller. The marine fired from side to side, the demons were turned to smouldering chunks and ash. The marine swung around and kicked a demon in the side of its head, nanotechnology on the surface of the marines boot registered the lethal use of force and restructured its shape to apply greater damage to the blow. The demon’s head exploded, raining blood and brain. The marine was already focused on blasting another wave as the demon continued working its jaw, splashing blood from the remains of its head. Kronos silently moved to level three. The marine dashed from each side of the replica, firing wildly. The portals appeared with greater frequency. Horned, red-skinned demons appeared, charging angrily. The area became noticeably smoky after the marine blasted them. Firing blindly into the smoke, he still managed to bag the monsters. When a Mancubus appeared, he tore its thermal cannon from the cybernetic fixture, the alien screamed as it splashed blood from its torn arm. He lifted the flamethrower and shot fire throughout the area. Fire burned on spots on the floor and the monsters that were hit were running wildly, providing adequate illumination. He dropped the thermal canon and continued firing plasma. The fighting intensified. The plasma flew freely, the burnt chunks of alien crunched loudly under the marines’ boots. Revenant and hell barons appeared in place of the demons. The marine was sent diving out of the way of their attacks. He fired back a long stream of plasma, then fired the last of the energy cell in a burst in a cacodemon’s eye. He reloaded the plasma rifle as a hell baron stomped toward him, he fired another burst of plasma at its head, its face became a melted mess but the monster was barely slowed down. He rolled out of its reach and fired another long stream, several aliens cried out in demonic tongue as they fell to chunks. 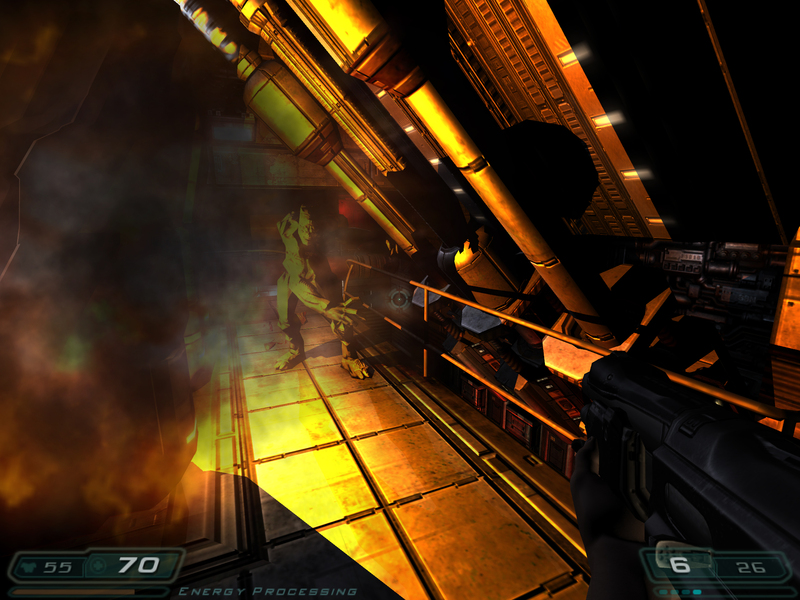 After killing a couple more Cacodemons, the area was swamped in smoke from burning aliens with plasma. Dr. Kronos moved the experiment to level five and activated the infrared holography imaging mode to see through the smoke. The portals were opening in rapid-fire around the marine. The marines’ attacks, fueled by the BSK serum and the mega-armors nanotech surface made brutal work of the aliens. The marine kicked heads flying while firing plasma, his punches shattered the chests of his foes, all the while portals would continue opening. Blood from the fallen beasts streaked through the air and bounced back and forth against the portal energy. The marines’ attacks became even faster, he ditched the rifle and began dealing devastating blows to the aliens. Kronos moved from level five to the maximum, level seven. “Final sequence”, he said. The marine caused a Hell Knight’s head to explode with three punches, demons were sent flying above the heads of its brethren before slamming into them. The marines’ attacks became faster and more efficient before the unending army of defiant aliens. From the control room the marine’s movements were too fast to be studied, the researchers had to rely on playing back video of the experiment on slower playing speeds. The marine’s eyes were suddenly a shade of burning white. He thrust his hands out and an energy shockwave shot out, flooring several Hell Knight. The marines mind was exploding with adrenaline as he ripped apart the aliens and hurled their remains at the others. A veil was lifted from before the marine’s eyes and a thought of great intensity touched his mind. Energy shot through him. The aliens were thrown to the walls and into each other, against a burst of energy that moved through the marine, accompanied by a mysterious humming sound. “Scanners are running fine, sir” Mason called to Kronos, who was at the window openly fixated on the awesome sight. Throbbing energy was surging away from the marine in greater and greater force until a blanket of energy appeared behind the marine, it looked like a disembodied mouth filled with stars, it stretched and enveloped the marine. The dazzling portal then swirled out of existence and vanished in a loud thunderous tone. The tone died down and the demons began to surge through the area again. Kronos turned away from the window, he was clearly shaken up from what he saw, an extremely rare occurrence. “All sensor logs are intact, sir” he replied softly. “Good, lets get this mess cleaned up” he said. Using his terminal to label the report as urgent, Kronos sent all the data to Central. The team of researchers went to work on what would be an extremely long incident report.